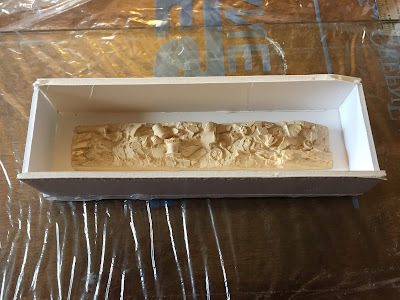 The rubber mold-making materials arrived from Micro-Mark and - as has been the typical story with this project - they sat in the unopened box for a few weeks. But this weekend I got a block of time to get them out and make my first rubber mold! The photo above shows where I'd left off: master hot glued to a foamcore base and foamcore walls hot glued together to make a box (make sure all of the joints are sealed - you don't want any material leaking out). 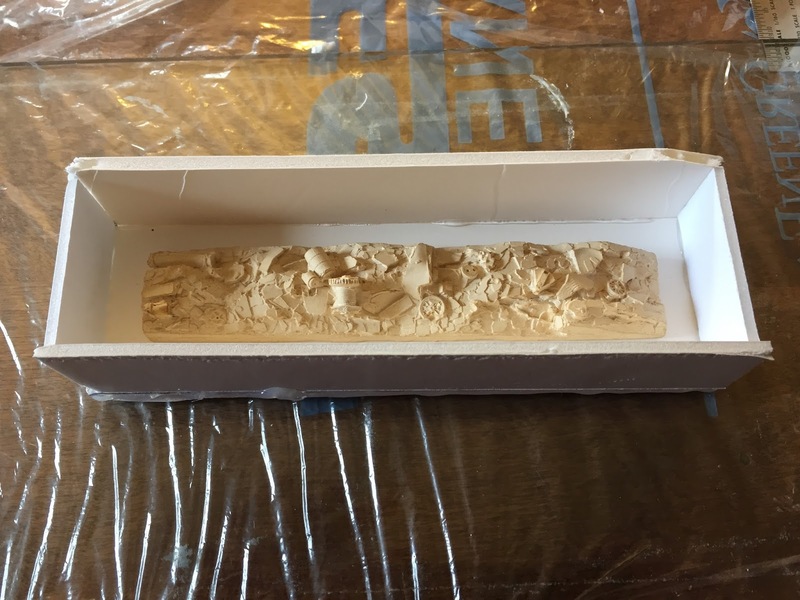 Apply mold release to the master and the inside of the box. Wait to dry. Pour the rubber into the mold from high up (12" +/-) so you have a small, thin stream (again, to reduce bubbles), starting in one corner and covering the entire master. Straightforward in description. Execution was a wee bit different . . .
First, the mold release must've seeped under the master because it dissolved the hot glue holding it in place(!!). I wiped down the foamcore and the bottom of the master with a paper towel, and re-hot glued it. Once that cooled, I mixed and poured the rubber, but then discovered that I didn't make quite enough material - it covered all but the "highest" part of the master! No worries (because: test). And as if that wasn't bad enough, as I was pouring the rubber, I noticed that other parts of the master weren't being covered - it was like the master was starting to float up. . .
Now, that just ain't right. So I pressed the master back down into the rubber and held it in place with a stirring stick in one hand, while I used the other hand to hot glue a couple scraps of foam core onto a block of wood. If necessity is the mother of invention, desperation is the father of ingenuity. Resting on the ends, the wood block wouldn't have been able to press the master down, so the little white bits are the foamcore scraps used to fill the gap between the wood weight and the sticking-up portion of the master. Of course, the wood is either warped or the ends of the box aren't quite level with each other. So the handy dandy baby powder bottle is resting on one side to keep the wood tilted properly. Ah well. Again - this is only a test. Despite these hiccups (hiccoughs? ), I'm actually enjoying learning this process. Resin casting - like soldering or airbrushing - is one of those things that's so mysterious in the hobby and I'm glad to be confronting my fear of failure and enjoying the journey. At the end of the day, worst case scenario is that I'm only out a little time and money. And the longer I'm in this hobby the more I realize that that's the price - literally and figuratively - of getting over some of these hurdles and developing some really useful skills. Of course, I may change my tune when I see how this thing actually comes out . . . stay tuned! Sounds like you have the right attitude - give it a try, see how it goes, and adapt! Reminds me of a Rube Goldberg invention!